Winners at Saturday's Beach to Beacon race will be awarded a medal box handcrafted in Maine. 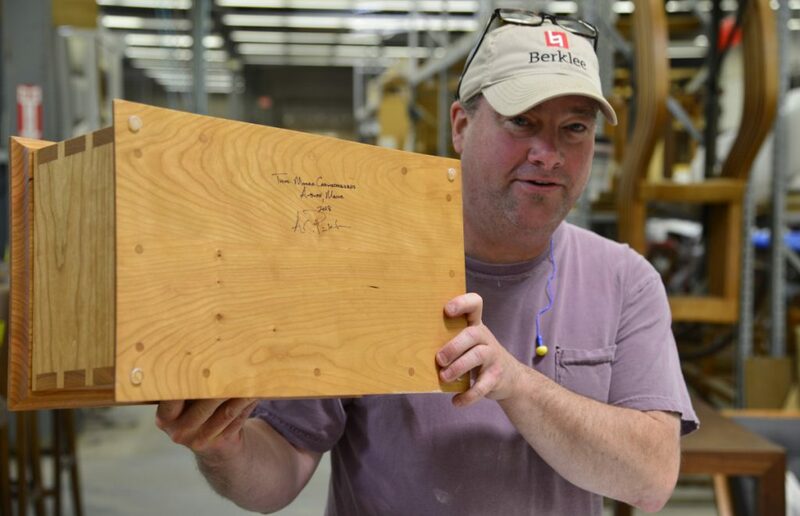 On Saturday, when the winning runners cross the finish line at the TD Beach to Beacon 10K Race, they’ll not only be awarded a cash prize, but also a handcrafted wooden box from one of Maine’s best-known furniture makers, Thos. Moser. This will mark the fifth year Thos. Moser craftsmen have made such trophies for the race, which attracts 6,500 athletes from all over the world and benefits a different Maine charity each year. (This year, the TD Bank Charitable Foundation – the bank sponsors the race – will donate $30,000 to WinterKids, a nonprofit that helps children develop healthy habits.) Olympic gold medalist Joan Benoit Samuelson, who founded the race in 1998, presents the boxes to the winners each year. Thos. 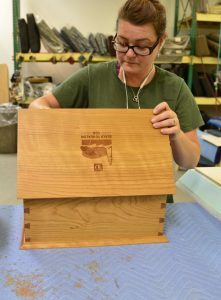 Moser makes 10 Beacon Boxes each year. Each Beacon Box features interlocking sides with exposed dovetail joints. A removable tray inside is tailor-made for storing running medals. The tray has a center divider that runs the length of the box, creating slots for holding medals with attached ribbons. The bibs runners save from their races are stored in the bottom of the box. 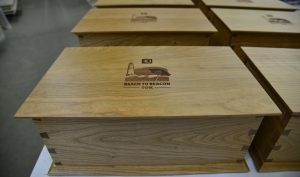 The boxes are hand finished and are laser-engraved with the Beach to Beacon logo. Some years, the boxes are made from North American cherry, other years walnut. “The box by design, and at the request of the race, it’s built with scrap wood because the race values sustainability and being green,” said Steve Wyman, manager of Thos. Moser’s Freeport showroom. Wyman said the company makes 10 Beacon Boxes each year. The top male and female finishers in four races get them as trophies; the other two boxes are raffled off to a race volunteer and to a sponsor. Wyman said it takes “quite a while” to finish them. The first year, one of Moser’s sons, Andy Moser – a master craftsman – made all of them. “It probably takes a cabinetmaker over a week to make all the boxes,” Wyman said. The handcrafted boxes, which are engraved with the Beach to Beacon logo, can store running medals and race bibs. This year, the job was split among 10 cabinetmakers; each signed one of the boxes, and each box is also signed by Samuelson and Thomas Moser. One of the cabinetmakers, Andy Pinkham, will run in Saturday’s race, hoping to win a Beacon Box for himself. If you’re wondering why we are telling you about the Beacon Boxes in this space, since unless you run – and win – what is it to you? Well, the boxes (minus the laser-engraved logo) are also available to the public, at a cost of $600 for cherry and $650 for walnut. Find them at Thos. Moser showrooms or online at thosmoser.com. Correction: This story was updated at 2:10 p.m. Wednesday, August 1, 2018, to correct a reference to Andy Moser.